Green Crack Cannabis produces a soaring, euphoric high and energizing body stone. With its powerful, euphoric effects and energizing ‘body-stone’ Green Crush, as it was originally named, acquired the name, Green Crack, and it stuck. From the West Coast rappers, and medical Marijuana dispensaries, to the Amsterdam Coffee-shops. Green Crack seeds have become increasingly popular with both indoor and outdoor gardens across the world. Some people may find the name Green Crack a little intimidating and be put off, due to the ‘crack’ reference, but this Cannabis strain has nothing to do with hard drugs, it does however have an extremely powerful energetic effect on the mind and body. Combining the genetics from Chem Dawg and a pure Afghan, Green Crack seeds are 100% pure Indica, producing strong plants, with an average height between 120 – 170 cm tall. Perfectly suited to either indoor, or outdoor gardens, Green Crack seeds will flourish in either soil or hydroponic set-ups, with plenty of branches and budding sites, producing a heavy, healthy yield. Considered a forgiving strain, and a good choice for growers of all levels of experience. These Green Crack seeds are of the highest quality, completely feminized, producing female-only plants. 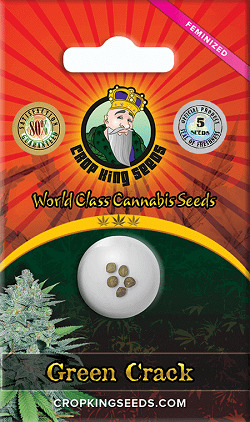 All the Marijuana seeds sold by growers choice are hand-selected to ensure the seeds you receive are fresh and healthy. Germination is guaranteed, and with complete customer support from purchase to harvest, you know you are buying the finest Marijuana seeds containing all the traits and characteristics you expect. Full and complete maturity is reached in approximately eight weeks, or for outdoor USA growers, early October at the latest. The buds are very large and dense, totally covered in resin with an earthy-fruity aroma. Green Crack seeds do not only produce high quality buds, they also produce heavy yields, with harvests of approximately 500 grams per square meter achievable, especially when grown using Screen-of-Green technique. Outdoor growers, planting in late Spring and allowing a naturally longer vegetative period, will enjoy their harvests around early October, with exceptionally heavy yields per plant. Once dried and cured, the buds have a sweet-citrus, earthy smell and flavor, are hard, dense and a colorful shade of light green. However, it’s the high THC level of approximately 22% that really makes Green Crack a favorite for many smokers. Mature buds create a complex high, achieved by elevated THC and low CBD levels. It’s energizing, yet relaxing, calming but sociable. It’s almost the perfect Marijuana high and is used as a powerful form of daytime medication by many medical Marijuana users. Green Crack is a powerful strain of Cannabis, and not for light smokers. Easy to grow and with good yields, it’s gaining a reputation across the USA for it’s strong medicinal effects and is highly sought after in many of the marijuana dispensaries. All seeds are dispatched directly from Amsterdam, ensuring you get the freshest, highest quality seeds possible. Super stealth packaging and postage to the USA is included in the price. All deliveries are guaranteed to arrive, and if, for whatever reason, your Green Crack seeds do not, replacements will be sent out totally free and without fail. Buy the very best quality Green Crack seeds, with fast, guaranteed delivery to the Canada, USA and Europe. Available to buy in packs of 5, 10 and 25 feminized Green Crack Seeds. Sign up to the newsletter to win up to $200 in free weed seeds. If 90% of your marijuana seeds do not germinate, then they will be replaced. Buy Green Crack Seeds today and receive fast discreet shipping to Canada and all US states.